I discovered an interesting story on April 18 about a "big foot" found in Lakeville, Massachusetts by some kids in the woods on March 29. They alerted authorities thinking it might be human. Since I watch for "Bigfoot" stories, this one caught my attention. It's a bit of an oddity to find a mystery body part just lying around. To be clear, The Patriot Ledger did not say that this was anything other than unknown and NOT human. That is, they did not suggest that it was an actual leftover piece of Bigfoot. They didn't need to. Everyone else did. Bigfoot blogs and weird news sites went there. It was "unknown" and, therefore, Bigfoot. That's some majorly faulty logic there. We have no verified specimen of Bigfoot. None. However, we do have a very plausible explanation to what this was -- a bear paw. Bear paws do resemble a human foot when they are in this state of decomposition. The kids were justified in panicking a bit about the find. Mistakes have happened so often before that the resemblance is mentioned in forensic instruction. Ask people who have seen skinned bears, they look very human in musculature. A reasonable guess as to what happened may be that a bear died or was killed and a scavenger made off with the paw. It does happen. You can read reasonable takes on this story here and here. 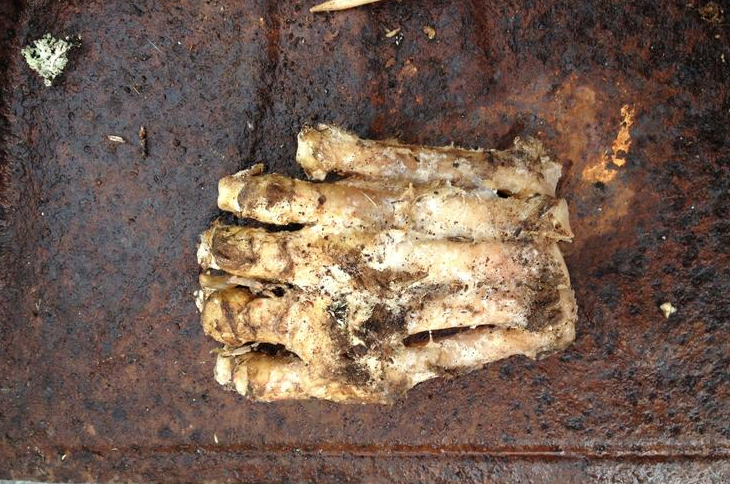 Several days later, the story is all over the Internet with the headline that this may be a Bigfoot's big foot. This may be evidence it exists. "Experts" are "baffled". (No professional says "baffled", he just says, "I don't know".) But again, it's critical to understand that "I don't know" does not equal "it could be Bigfoot". Bigfoot is not a plausible choice since it has not been shown to actually exist as a flesh and bone creature. I have a problem with Bigfoot promotion. Blogs and web sites covering Bigfoot "news" (of which there is a surprisingly large amount, daily) get big hits for every new "blobsquatch" (blurry blob that people say is a Sasquatch) photo or video. Rumors and rampant speculation is the meat of these blogs and the comments on each post are something you truly do not want to waste your time reading. There is no intelligent discussion to be had, skepticism is unwanted. Their "evidence" is dubious, of poor quality, or misinterpreted. In other words, worthless. Therefore, when I gave the most likely conclusion of bear paw on my weird news site, it was ignored and fantastical explanations ruled the media. I'd like to think that when you come across a mystery, at least some people would prefer to know the ACTUAL answer. But, I'm not sure that's true. Belief reigns. People invested in the Bigfoot (especially monetarily) will stoke the mystery and eschew reality. (No TV network wants a show called "Finding Mundane Explanations for Bigfoot".) I understand why it's hard for people to give up on a dream of discovering a mystery creature, but do we have to forego all rational thought to do it? How does it help gain knowledge if you make every normal thing abnormal and extraordinary without justification? The Bigfoot community will happily live with the fiction. It's just more fun. It's also intellectually dishonest. If the science is not there, it's not there. It gets you nothing but discredited to make stuff up. For those who willfully ignore all the plausible answers and instead hype the outrageous one, you are poisoning your own field.